Today's dish is a feast of contrasting flavours and textures. Creamy goat's cheese sits on top of a crunchy garlic-scented crostini and ripe tomatoes mingle with nutty chickpeas. 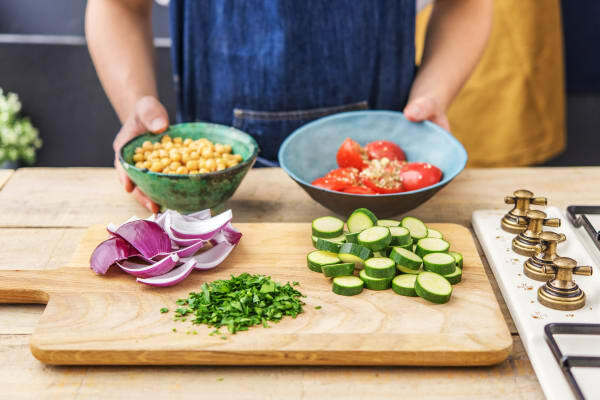 As if that wasn't enough, you'll be finishing everything off with some charred courgette slices and a sprinkling of fragrant zahtar. Enjoy! Preheat your oven to 180°C. 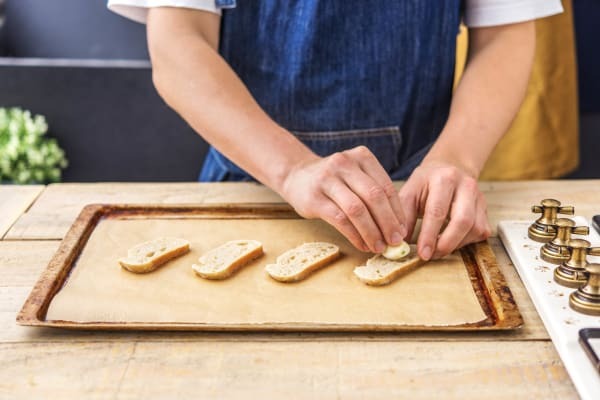 Cut the baguette into 1cm thick slices (2 per person) and place on a lined baking tray. Peel the garlic and gently rub the clove over the surface of each slice (keep the clove once you've done this). Drizzle on the olive oil (amount specified in the ingredient list) and season with salt and black pepper. Bake on the top shelf of your oven until golden brown, about 10 mins. Peel and quarter the red onion. Separate the layers of each quarter and set aside. Chop the tomato into wedges and pop in a large bowl. Grate the garlic (or use a garlic press) and add it to the tomato. Season with salt and add half the zahtar spice blend. Mix well. Remove the top and bottom from the courgette and slice into 1cm rounds. Drain and rinse the chickpeas in a sieve. Roughly chop the parsley leaves (stalks and all). 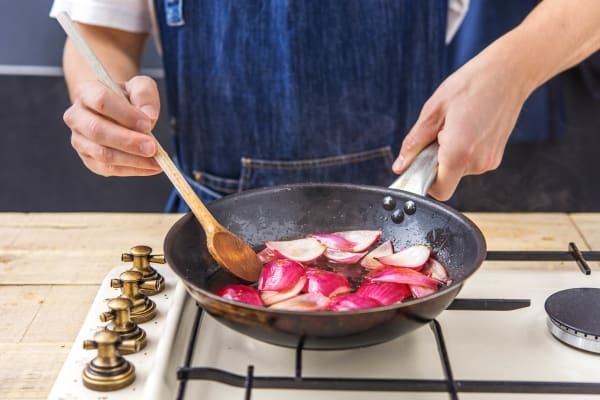 Put a drizzle of oil in a frying pan over medium-high heat. Add the onion and cook, stirring occasionally, 3 mins. When it starts to brown, lower the heat to medium, season with salt and the red wine vinegar and a pinch of sugar (if you have some). Let the red wine vinegar bubble away until it has almost evaporated, then add a splash of water. Cook for 5 mins, then add to the bowl with the tomato. Wipe the pan out with some kitchen paper and then return it to high heat (no oil). 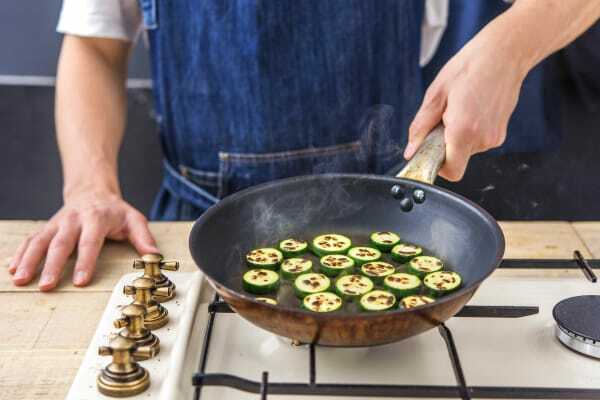 Once hot, arrange the courgette slices in the pan in a single layer. Cook until beginning to blacken slightly, 4 mins on each side. TIP: You may need to do this in batches. Remove from the pan, allow to cool slightly. Meanwhile, cut the goat’s cheese into even slices (four per person). 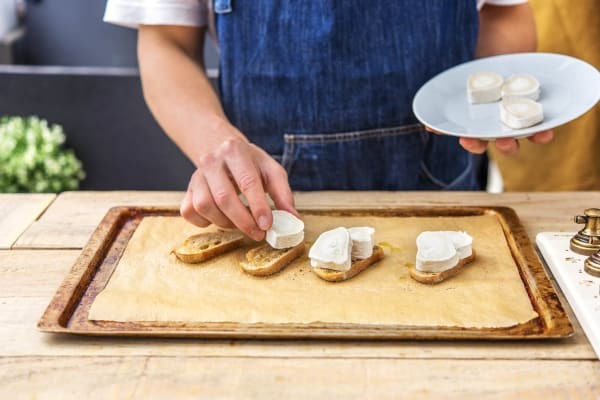 Put two slices of goat’s cheese on each slice of crostini and place on your baking tray. Bake on the top shelf of your oven until the cheese starts to melt, 7 mins. 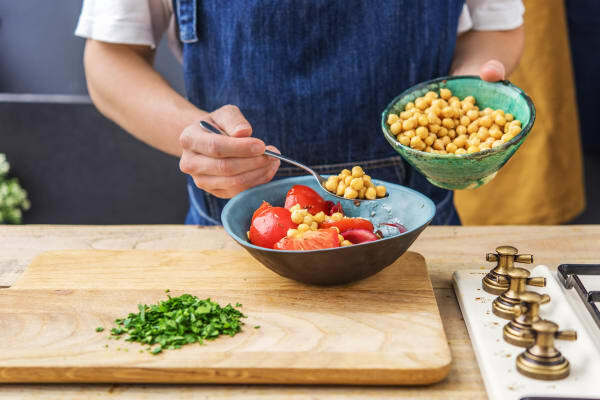 Mix the chickpeas and parsley into the tomato and stir in the olive oil (amount specified in the ingredient list). 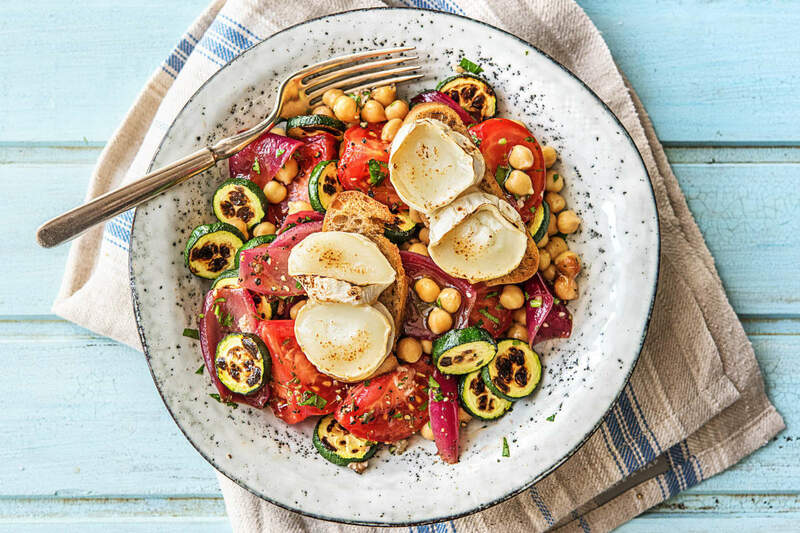 Spoon a generous amount of the chickpea salad onto plates, add a few slices of courgette and top with a goat's cheese crostini. Finish with a sprinkling of the remaining zahtar spice blend. Enjoy!